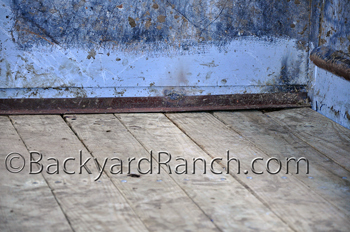 See our horse trailer floor repair part 1 page before reading this page. 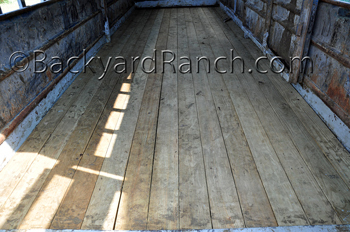 The most common horse trailer repair is the floor replacement. To install the new floor you have to remove the old floor. We used a hand grinder to grind off the heads of the screws that were still holding the floor to the frame. After the screw heads were ground off, we checked where the braces were underneath the floor and then used a chainsaw to cut across all the boards, missing the braces. Be careful not to cut into more than half of the outside boards, there will be wide steel running down the sides of the trailer from front to back. Using a crowbar and a hammer, we removed the floor boards. We ground off the remaining screw pieces off of the frame. We used a wire brush to expose all the rusted and weak spots in the braces and thin spots of the side supports. We replaced much of the side supports that were rusted away. Angle iron braces were replaced as needed. 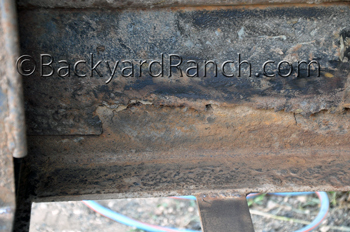 Rust and replacement are also common in horse trailer repair. 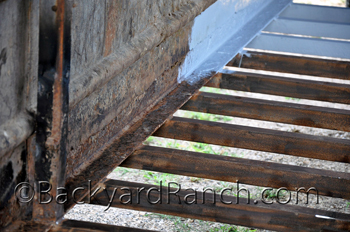 Then,sanded down the side floor supports and all the angle iron floor supports, removing the remaining rust. There really is no point in installing a brand new floor on a rust eaten frame. The frame will give way before it is time to replace the floor again. Coat the braces and side pieces with a rust resistant primer. During the horse trailer repair, make sure that you understand how the boards are supposed to be replaced into the trailer. You may have to cut and remove a piece of steel at either end to slide the replacement boards back in. Make sure that you get enough bolts or screws to install the new floor. Galvanized carriage bolts with lock nuts are recommended, their rounded heads will keep the horse from catching a shoe on them. 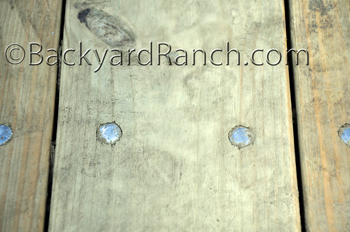 The galvanized finish will make the bolts last longer before rusting. The treated lumber may require a trim to fit into the trailer, it should fit as snug as possible. Remember, the new lumber will dry and shrink some. Drill holes for your bolts through the floor and braces then use washers and lock nuts. Tighten down secure to make sure that they don’t come loose. The key to keeping a trailer floor from rotting is to clean out the trailer well after each use. After the trailer floor has initially dried and the gaps appear, you can coat the floor with linseed oil. A hand pump sprayer works well and is inexpensive. 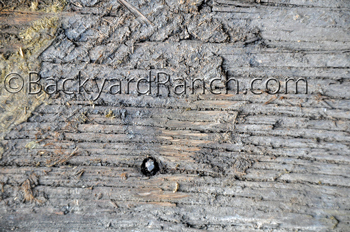 Rough cut lumber is ideal if you have a place to get it. If not, treated lumber will do. Remember that the new floor made by treated lumber will be slick especially with water or excrement on it. This is a danger to you and your animals. There will be better traction with rough cut lumber. 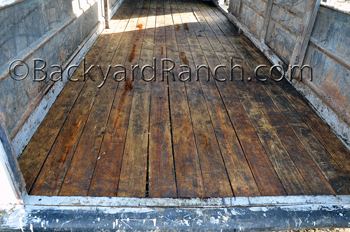 Taking care of the new floor will also make your horse trailer repair last longer. There are additives you can use in the linseed oil or water resistant sealer that makes the finish rough so that it is not too slick for your animals once the get in the trailer. You can also use trailer floor mats – which is what we strongly recommend. Make sure that the mats have ridges on both sides, the water and excrement need a place to get out of the horse trailer on the under side of the mat. Ridges on the top side are for traction for the animals. Flat, smooth rubber mats will be very slick when they are wet. If the excrement and dirt are trapped under the mat, the boards will mold and rot fast. We bought thick rubber mats with ridges on both sides and cut them to fit from side to side and front to back solid. We clean out the trailer reguarly (especially at end of a big job), we clean the mats, remove them and clean the floor if necessary. Then replace the mats. We clean, wash, let dry and retreat the floor with linseed oil each year at the end of summer when the days are still hot so it will soak in.